I finally got around to taking a picture of the second Darkside Cowl (Ravelry Link) which I washed and dried towards the end of last week. It's been sitting waiting for its photo shoot before I package it up and send it to its intended recipient. A little late for a Christmas present but at least it will hopefully arrive before Christmas 2010! 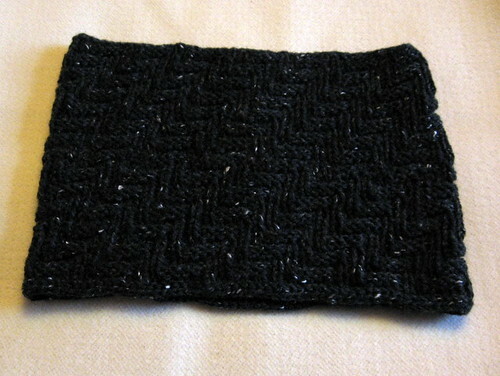 As before this is the Darkside Cowl by Sara Fama, Patons UK Wool Blend Aran - this time in charcoal. As the intended recipient is a bit bigger than Dave, I added 24 stitches to the count, giving 112 stitches to the round. I also knit a bit more, adding an extra inch to the length making it a total of 9 inches in all. No shots of it being modeled as I don't have a suitably proportioned gentleman to hand. Ho hum. Moving swiftly on, I made an attempt to revive my flagging mojo with a quick ish project intended to inspire. My thought was to make something for me and that it should be a relatively fast fix, so no time to get bored or to fall asleep. 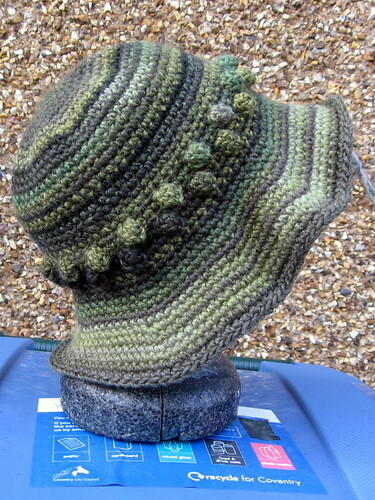 After much deliberation, I chose the Bobbled Cloche (Ravelry Link) by Kathy Merrick from Vogue Knittings's Crocheted Hats, which is part of the "On the Go" series. As hoped, this was a fast project and after checking my gauge took less than a week to complete. The yarn is Katia Azteca in a sort of mossy green, which was a little something I picked up in Penzance a couple of years ago. It's an aran equivalent and I had to go up to a 6mm hook to hit gauge, but once I did I was spot on. Despite this, it looked like the pattern instructions were wrong - at least with my head in mind - as the first bobble row seemed to start way too early. So I added an extra 4 rows of working 'sc' even before starting the first bobble row at Round 23. I worked the rest of the hat as per pattern. It's not me. 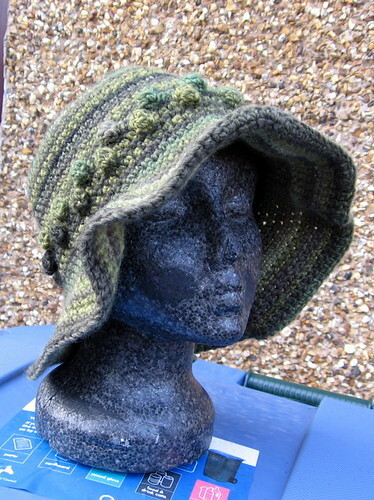 I tried it on and while I think it would look great on a rounder face I just look a bit swamped by the brim. One to put down to experience; not being much of a hat wearer I don't actually know what kind of hat styles suit me. The only way to find out I guess would be to go to a hat shop and try on lots of hats while looking at myself critically in the mirror. Ah well. 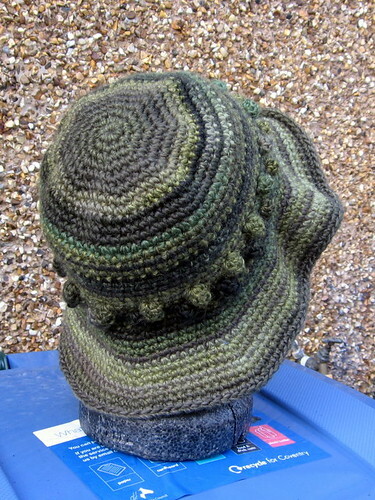 I enjoyed making the hat and I'm pleased with the result... It's just failed the 'making something for me' aim somewhat. What a pity it doesn't suit you cos it looks lovely. You can always come over here and I'll dig out a few hats, i have a few here and there :) See if we can work out what styles work on you !